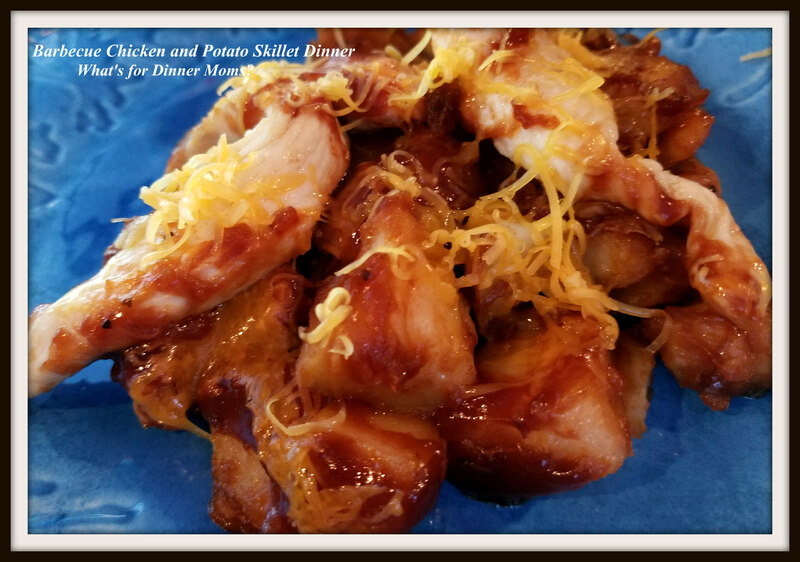 Barbecue Chicken and Potato Skillet Dinner – What's for Dinner Moms? I am still trying super simple dinners most nights of the week right now. I keep telling myself things will slow down and I know things are going to come to an abrupt stop very soon but until then I will enjoy the ride of senior year with my daughter and finishing freshman year with my son. They are both trying to find their wings in so many ways. They are such different kids but each so wonderful in their own ways. They make me laugh and keep me on my toes! This was such a super simple meal. My son actually made this meal. The toughest part for him was understanding how to cut the few eyes from the potatoes and cut them. It took him forever when I realized he was taking every single blemish out of the potatoes! We corrected that and then the meal went smoothly. Add a green vegetable and a green side salad and this is a terrific meal. Place potatoes in a microwave safe bowl. Pour the water into the bowl and cover. Cook in microwave on high for 5 minutes, stir potatoes and cook another 5 minutes. Pierce potatoes they should be almost done cooking but not quite. Drain water from potatoes. Add oil to a large skillet (you will be adding potatoes to the skillet later) over medium heat. Add the chicken and cook until the strips are cooked through. Remove them from the pan and cover to keep warm. Add potatoes and onions to skillet (add a bit of olive oil if needed). Allow them to cook about 5-8 minutes until they are slightly browned and cooked through. 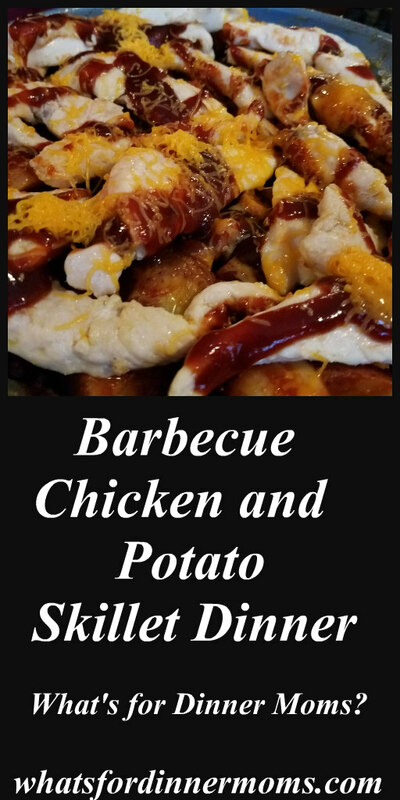 Add 1 cup of barbecue sauce to potatoes and stir well. 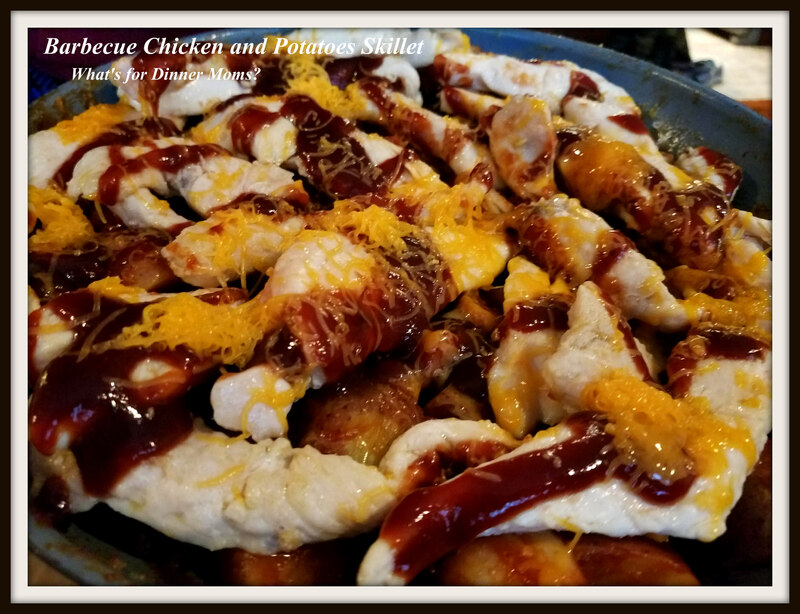 Lay chicken over the top of the potatoes and drizzle a bit of the leftover sauce on the chicken. Sprinkle with cheddar cheese and cover over low heat. Allow dish to sit for about 5 minutes while cheese melts and chicken warms. Thank you! It was super simple. Thanks! With a bit of cheese? Yummmm. wonderful dish , looks awesome! I love this idea! I’ll show it to my son and his g/f! This sounds delicious! May just have to try it. Thanks for sharing it! Thank you! Hope you like it if you do!